Countless users who own desktops need wifi on there system for various reasons. But when looking at the selection of vendors offering of Mac OS X compatible cards there is a lot to be desired. So what is the solution to this? Building your own wifi card. As many users have seen you can purchase a PCIe adaptor for a wifi card. They do work however many of these adaptors look and feel cheap and when installing it into your system you may be worried about the build quality. 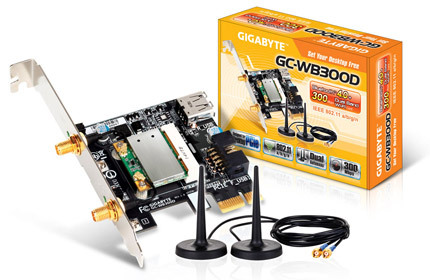 Gigabyte has stepped into the market with there GC-WB300D Wifi card ver. 1.0. The card feels well made and of high quality. Total Cost with shipping $29.99. This card comes with a preinstalled wifi card that has bluetooth 4.0 as well. 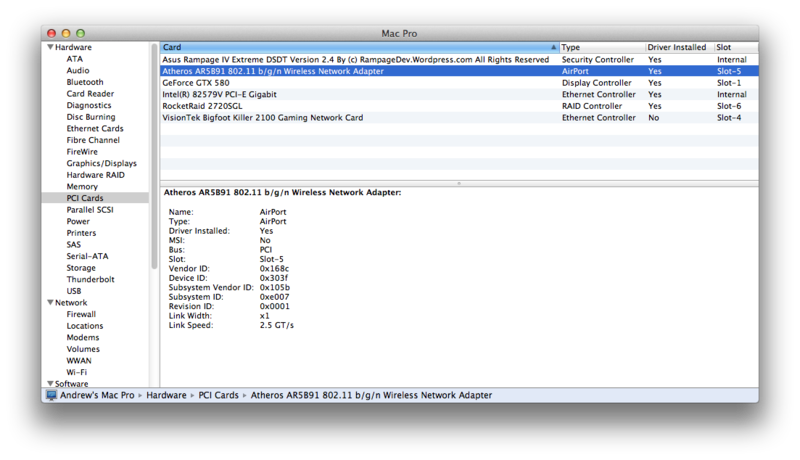 However neither the wifi card or the bluetooth card is supported under Mac OS X. So we will need to change the wifi card and bluetooth to ones that are supported. Atheros AR5B91 is the wifi card that I had purchased to replace the existing card. The total cost with shipping $2.79. Rocketfish Bluetooth Adapter BCM2046B1 is the bluetooth dongle that I had purchased to replace the existing card. Total Cost with shipping $4.99. 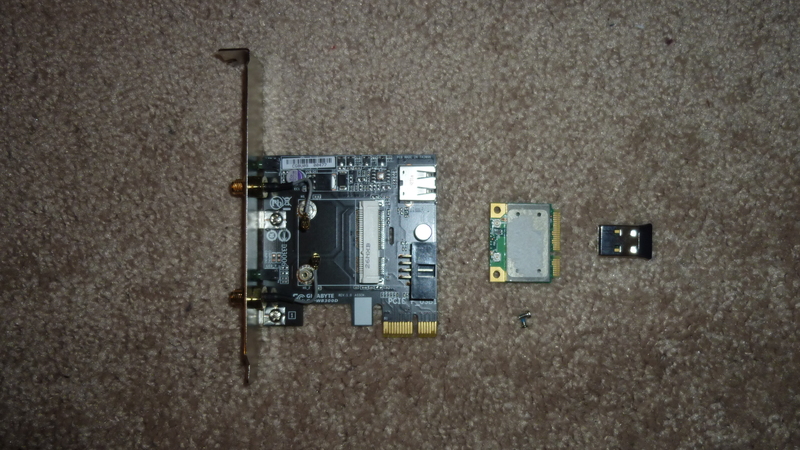 After removing the existing wifi card from the Gigabyte adaptor I laid out the parts. I then installed the wifi card and the bluetooth dongle into the card slot and the USB port respectively. I then was ready to install the card into my system. I installed the card into a available PCIe slot and then connected the USB cable ,provided with the card, from the adaptor to a USB 2.0 header on the system motherboard. Last I attached the antennas to the back of the card. With the Gigabyte adaptor I was able to create a wifi card that supported both wifi and bluetooth while being fully in-closed in my system. Also the card feels well made and of high quality giving peace of mind in installing it into your system. If you need a wifi solution for Mac OS X this is what you should use. I bought one of the GC-WB300D cards and guess what mine was missing upon arrival. The USB Socket. It has a dongle cable to connect from a header on the card to a USB socket on the Motherboard but what good does that do us? I have asked the ebay seller to see if they can “fix” my issue, since the listing on ebay pictured a card with a USB socket. Funny the picture on my box doesn’t have one. I also was hoping the full-height Airport Extreme N450 card I had would fit but no joy, so I ordered a half height card you suggested above. Have to wait for it to come in from China before I can even test the card. You have to be careful on ebay with this card… hope in the end it all works out for you. If I add the Atheros AR5B91 module to the Rev 1.1 Gigabyte board (with no USB socket), then will I get ONLY WiFi, since I am not adding a Bluetooth dongle. With no Bluetooth dongle plugged in, do I even need to attach the USB header to the board? If I need to use a dongle, I may as well just use a USB jack that leads to a header and have it a separate unit. Does the Atheros AR5B91 use both antennas for WiFi? or does it only use one? Correct. You do not need to connect the USB part of the MB. It uses both antennas for wifi. Well I can’t say it ended well. I tried the card you suggested and it wont work. I then tried an Half Mini PCI-E Wireless Card Atheros AR9280 AR5BHB92, as well per TonyMac and neither will connect to my wireless. I keep getting ! Connection Failed. when I type in my network password and hit enter. As for the card, the seller optioned for me a refund but stated the cards shipped from a warehouse so they couldn’t guarantee I would get one with a USB port on it. So I decided to keep thew card, guess I am kinda stuck trying to get a working NIC. 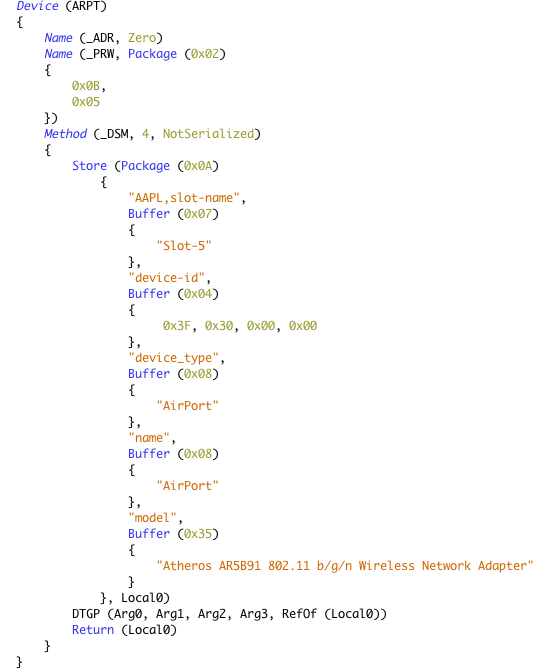 Maybe I need a short version of the N450 Airport card that works in my laptops…..
Atheros AR5B91 is what I have. Not the same one as you. On 10.8.4 I assume? This solution is working in Mavericks? I have the TP-LINK TL-WDN4800 which was supposed to work but no lucky here, Mavericks don’t recognized. This method is used to enable the wifi that comes with the motherboard gigabyte GA-X79S UP5 Wifi.